Reasons For the Name "Admirable"
Jesus Christ, the only-begotten Son of God, chose the incomparable Virgin Mary from among all the creatures to be His Mother and deigned to be nourished and governed by her. In His infinite goodness He also gave her to us to be our Queen, our Mother, and our sure Refuge in all our needs. He therefore wishes us to honor her as He honors her and to love her as He loves her. According to the Apostle Saint Paul, Christ is the Head of His Mystical Body, the Church, and we are the members. We must therefore be animated by His Spirit; we must follow His inspirations, walk the path He has traced, and continue, as it were, His life on earth by practising the virtues which were His own. It follows that our devotion to His Holy Mother must be a continuation of His devotion to her. We must be filled with the sentiments of respect, submission, and affection which He entertained for her on earth and still entertains in heaven. 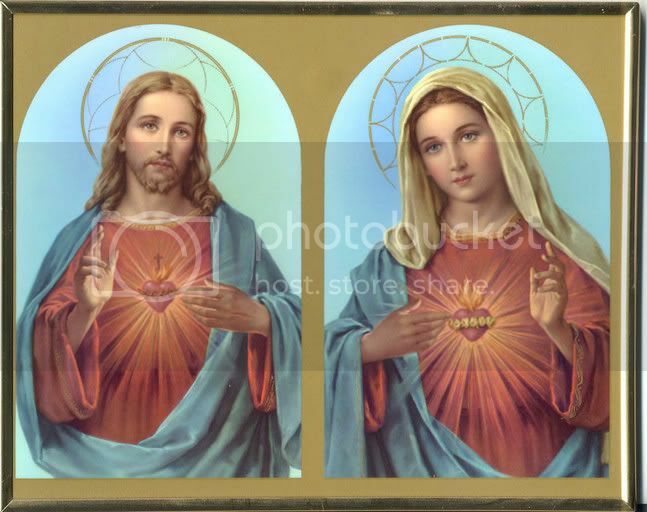 Mary always held and will hold forever the first place in the Sacred Heart of her Divine Son; she always was and never will cease to be, the first object of His love after the Eternal Father; and so He wishes that, next to God, she should be the principal object of our devotion. For this reason, after the veneration we owe to the Divine Majesty of God, we cannot render a greater service to Jesus Christ or do anything more pleasing to Him than to serve and honor His most worthy Mother. The human will is not, however, moved to love a fellow creature unless the intellect first knows what renders it worthy of respect and esteem. The infinite zeal with which the Son of God is inflamed for all that concerns His dear Mother has urged Him to reveal to us through the inspired words of Sacred Scripture and through the writings of the Fathers some small measure of the perfections with which He has enriched her. The reality far surpassing our knowledge of her in this vale of darkness will be revealed only in heaven, the land of unclouded light. Among the divinely inspired passages of Sacred Scripture I select one from the twelfth chapter of the Apocalypse, which is a compendium of all the great things that can be said or thought of our marvelous Queen. "A great sign appeared in heaven: a woman clothed with the sun, and the moon under her feet, and on her head a crown of twelve stars." What is this great sign? Who is this miraculous woman? St. Epiphanius, St. Augustine, St. Bernard, and many other holy doctors agree that the woman is Mary, the Queen among women, the Sovereign of angels and men, the Virgin of virgins. She is the woman who bore in her chaste womb the perfect man, the God-Man. "A woman shall compass a man." Mary appears in heaven because she comes from heaven, because she is heaven's masterpiece, the Empress of Heaven, its joy and its glory, in whom everything is heavenly. Even when her body dwelt on earth, her thoughts and affections were all rapt in heaven. She is clothed with the eternal Sun of the Godhead and with all the perfections of the Divine Essence which surround, fill, and penetrate her to such an extent that she has been transformed, as it were, in to the power, goodness, and holiness of God. She has the moon under her feet to show that the entire world is beneath her. None is above her, save only God, and she holds absolute sway over all created things. She is crowned with twelve stars that represent the virtues which shine so brightly in her soul. The mysteries of her life are as many stars more luminous by far than the brightest lights of the sky. The privileges and perogatives God has granted to her, the least of which is greater than anything shining in the firmament of heaven, as well as the glory of the saints of Paradise and of earth, are her crown, and her glory in a much fuller sense than the Philippians could be said to be the crown and joy of Saint Paul. But why does the Holy Ghost call Mary "a great sign"? It is simply to tell us everything in her is wonderful, and that the marvels that fill her being should be proclaimed to the entire world, so that she may become an object of the admiration for the inhabitants of heaven as well as for mankind on earth, and so that she may be the sweet delight of angels and men. This is likewise the reason why the Holy Ghost inspires the fatihful throughout the world to sing in her praise: Mater admirabilis-"Oh Mother most admirable." Moreover, according to the testimony of several trustworthy authors, a holy Jesuit who once asked the Mother of God to reveal to him which of the many titles in her Litany was most pleasing to her received this same answer: Mater admirabilis. Mary is truly admirable in all her perfections and in all her virtues. But what is most admirable in her is her virginal heart. The heart of the Mother of God is a world of marvels, an abyss of wonders, the source and principle of all the virtues which we admire in our glorious Queen: "All the glory of the King's daughter is within." It was through the humility, purity, and love of her most holy Heart that she merited to become the Mother of God and to receive the graces and privilges with which God enriched her on earth. These same sublime virtues of her Immaculate Heart have rendered her worthy of the glory and happiness that surround her in heaven, and of the great marvels that God has wrought in and through her. Do not be surprised if I say that the virginal Heart of this Mother of Fair Love is an admirable Heart indeed. Mary is admirable in her divine Maternity because as Saint Bernardine of Siena says, "to be Mother of God is the miracle of miracles." But the august Heart of Mary is also truly admirable for it is the principle of her divine Maternity and of the wonderful mysteries this privilege implies. Of Mary's admirable Heart I shall attempt to speak in this book, although to speak and write worthily of the holy Heart of God's own Mother one would need a heart of fire. To know and proclaim the perfections of the noble Heart of the Queen of Angels one should have the intellect of a cherub and the flaming love of a seraph. Nay more, it would be necessary to possess the mind, the heart, the tongue, and the hand of Jesus Christ, the King of all hearts, to understand, honor, proclaim, or commit to writing the treasure of sanctity contained in the holy Heart of Mary, the worthiest, most royal and most marvellous of all hearts after the most adorable Heart of our Saviour Himself. I am not so presumptuous as to believe that I can enclose within the pages of this book the immense teasure and the innumerable wonders contained in the incomparable Heart of Mary which is and will forever be the object of the ecstatic contemplation of the happy citizens of heaven. When the angels beheld their Queen and ours at the moment of her Immaculate Conception they were filled with admiration at such fullness of grace and in their wonderment exclaimed: "Who is she that cometh forth as the morning rising, fair as the moon, bright as the sun, terrible as an army set in array?" What then must their rejoicing be, now that they behold in heaven all the perfections of her Heart from the first moment of her life on earth until the last? The God of Angels finds even the footsteps of this glorious Queen so holy and so pleasing to His Divine Majesty that He exclaims: "How beautiful are thy steps in shoes, O prince's daughter!" Under His divine inspiration Holy Church, both Militant and Triumphant, celebrates on earth and in heaven Our Lady's visitation to her cousin Elizabeth. From this we see how great is Our Lord's desire that we should admire and honor as He does the many holy and admirable actions which were inspired in the most amiable Heart of His peerless Mother. If the smallest virtuous act of this heavenly Virgin represented in Sacred Scripture by one of her hairs, is so pleasing to God as to make Him proclaim that she has wounded and ravished His Heart with a hair of her neck, what must we think of the manifold acts of love which, like sacred flames, were constantly darting from the burning furnace of her virginal Heart ablaze with divine love? These flames were incessantly rising to Heaven to the Heart of the Most Holy Trinity. Holy church, whom the Divine Spirit guides in all things, celebrates on earth and will forever celebrate in heaven several feasts to honor the various events in the earthly life of the Mother of God, such as her Presentation, in which she offered herself to God in the temple of Jerusalem; her Purification to honor her obedience to a law that did not apply to her; the feast of Our Lady of the Snows in memory of the dedication of the first church consecrated to her. What praises and homage her Holy Heart then deserves, that Heart which for at least sixty-three years offered up so many acts of faith, hope, and love of God and chairty towards men, humility, obedience, and every other virtue? What mind can understand and what tongue express the richness of this incomparable Heart, the Sovereign of all hearts consecrated to Jesus? Her Heart is a vast sea of grace, a measureless ocean of perfections, an immense furnace of love. Would that I might lose myself as a drop of water in this ocean, or be consumed like a straw in this furnace, so that nothing of what I write could be considered as coming from me, but only from Jesus Christ who is the unique source of all good! O most Holy Mary, Thy Divine Son, Jesus, hath received thy Heart, and He alone knows the great treasures He has hidden therein. He it was Who lit the fire burning in this furnace, and none but He can measure the heights reached by the flames which leap from its abyss. He alone can measure the vast perfections with which He has enriched the masterpiece of His all-powerful goodness, or count the innumerable graces He has poured into this ocean of grace: "He created her in the Holy Ghost, and saw her, and numbered her, and measured her." And now I beseech thee, O most Blessed Virgin Mary, through thy Heart and for the honor of that very Heart to offer me to thy beloved Son and to pray that He may annihilate my personality and set Himself in the place of my nothingness, so that not my voice but His may be heard. May Jesus Christ be the author of this book, and I but the instrument of His surpassing love for thee and of the zeal with which He watches over the honor of thy most worthy Heart. May He inspire the thoughts He wishes to see expressed in this book and the very words He desires I should use. May His blessing rest in fullest measure on the readers of this book, and may He transform all its words into bright and ardent coals, so that their hearts may be purified, enlightened, and inflamed with the sacred fire of His love. In a word, may they become worthy to live according to God's heart and to be numbered a among the children of the maternal Heart of God's own Mother.